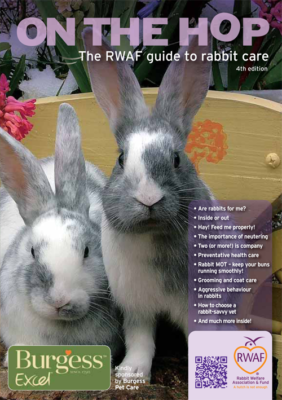 The On The Hop booklet is a comprehensive rabbit care guide. It’s over 50 pages long and replaces and updates our previous range of leaflets with extra sections such as how to choose a vet and a check list for when you are going on holiday. Download a free copy, or you can order a printed booklet online. Join the RWAF and we’ll include a copy in each membership pack. Join the RWAF and you’ll receive 75 booklets to give or sell to your clients or order printed copies directly from our online shop. Join the RWAF and you’ll receive 75 free booklets to sell or give to potential adopters. Read the product description for a full list of benefits. We encourage rescues to charge a nominal fee of between 50p and £1 for each so you won’t be out of pocket. If potential adopters don’t want to spend the nominal sum on so much useful information how will they react to a big vet bill? Vets and rescues – we ask that you do not charge more than the nominal amount suggested as we want as many rabbit owners as possible to read this vital information.